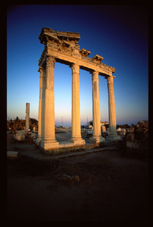 According to Strabon,Side was built by the Cymians who formed one of the Aeolian cities in the north of Izmir (Smyrna).The world “side”means pomegranate in the ancient local languages.According to discoveries arising out the excavations,Side was ruled by the Ptolemaics of Egypt in the third century BC and later by the Assyrian Kingdom.In 188 BC “Side”gained its indepence,but was later annexed to the Galata Kingdom in 78 BC,but then in 25 BC Side gained its independence again .Alas,it then became a target of the Pirates and Arabs and rapidly diminished after the 3rd century (AD).After you pass through the gate to the city,you arrive at a spacious area decorated with flat stones .This is the beginning of the two main streets. On both two sides of the streets are decorative porticos and behind them are shops.The column capitals are Corinthian.Across the door is the very grand monumental fountain,the “Nymphaion”.The Agora which has shops on tree sides,is shaped like a square and is surrounded by galleries with columns.In the center of this area are the remains of an altar made for the Goddess of Fortune and Fate Fortuna,the ruler of the fate ofcities. The amphitheater adacent to it,wich provides a panoramic view of the city,is very beautiful.The temples,the monumental road covered by the city today and the remains of the ancient harbor can be seen from here.